Successfully Added 2-Way Motorcycle Alarm Security System - 100 Meter Range to your Shopping Cart. 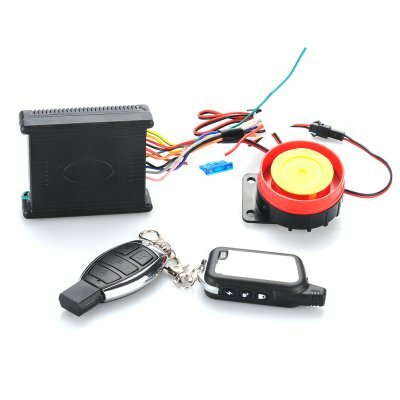 22-Way Motorcycle Alarm Security System with a 100 Meter Range helps protect your motorcycle with this complete kit that will inform you directly on the remote control when someone is tinkering with your bike. This ingenious Security System comes with a user-friendly remote control alarm that is set up to fully protect your bike from tampering and theft. Once armed and someone touches the motorcycle, the alarm goes off and siren beeps away, alerting people around and drawing attention to the perp. And, if the motorcycle is touched again within a short period of time, the alarm becomes even louder and lights start flashing in every direction, clearly letting others know that the bike is probably being stolen. At this stage, the motorcycle engine is locked and rendered inoperative. Moreover, a message is sent to the remote control to inform you directly! Yes, within a range of 100 meters, you get a message through the remote control each time an unusual thing happens! The system also has an anti-hijacking feature causing the motorbike engine to be cut off after a while. The sensitivity of the alarm system is also easily adjustable by the remote to three different settings according to your specific needs. What more? For additional peace of mind, an emergency security function ensures that the engine is completely immobilized if the motorcycle is forced to turn on. The 2-Way Motorcycle Alarm Security System is the ideal security solution to always find your motorbike where you park it! It is also brought to you at a factory-direct price by the online leader in security devices and electronics, Chinavasion. Receive instant messages on the remote control when the alarm turns on! The 2-way alarm is the newest technology in vehicle security system. Unlike traditional security systems, which only sound the siren or beep the horn when the alarm is triggered, a 2-way alarm is able to send an alert signal to a remote control, allowing its owner to react quickly and efficiently according to the detailed information displayed. Clock and alarm setting with sound and vibration in transmitter. 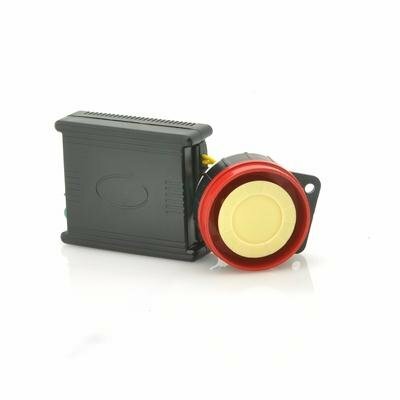 It is an alarm with a central horn of small dimensions that are very helpful in choosing a place to fix and patches from the package are great set very well. The manual is simple to understand and helpful in the installation, I did everything in less than half an hour, a dedicated cable did not to cut the whip of scoorer and now the alarm on my scooter everything is working properly, only had to put a relay extra to get started remotely. Just a note: do not put any type of plastic to protect the remote control with LCD and it made him to be scratched, and that could have packed it with a plastic bubble or other type of protection that does not happen.